Centuries ago Lord Shiv is said to have revealed himself to his true devotees in the form of a jyoti or a light. On their request for Him to reside by them for eternity, He installed Himself near them, as a linga, which is now known as Jyotirlinga. 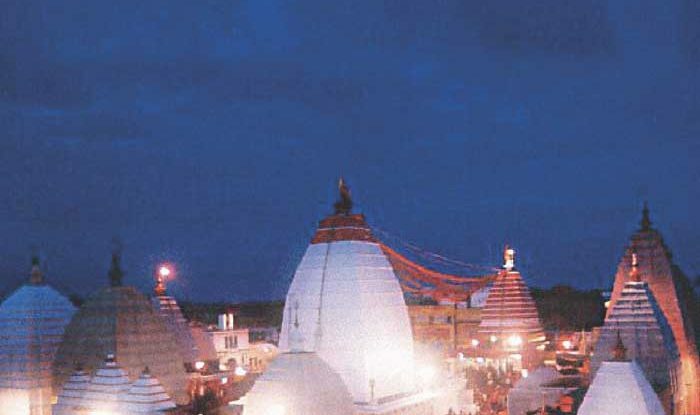 Sri Baidyanath Jyotirlinga is situated in Deogarh in the Santhal Parganas area of Bihar. In fact, Deogarh is also known as Baidyanath, Haritaki Vana, Ketaki Vana, Ravana Vana, Chitabhoomi and Hardapeetha. As per legend, the King of Lanka, Ravana had worshipped Lord Shiv in the main temple. He sacrificed his head ten times at a place marked out in the temple. Lord Shiv revived him and joined the heads to the body, as if by the work of a vaidya, hence this jyotirlinga goes by the name Baidyanath. It is believed that the “Lord of Physicians”, Lord Shiv, frees people from all kinds of ailments and diseases. According to Shiv Purana, it was in the Treta yuga that the Ravans performed penance to take Lord Shiv to his kingdom of Lanka. Lord Shiv then manifested as a linga, which Ravan could carry back to Lanka. Lord Shiv warned Ravan to not break his journey or place the linga anywhere, for whichever place the lingam is placed, it would stay fixed there forever. The devas devised a plan to prevent Ravan from taking the lingam to Lanka, for if that happened, he would become invincible. So Varun deva, God of waters, entered the belly of Ravana creating an uncontrollable urge in him to release water. Ravan looked for someone to handover the lingam to. Lord Vishnu then appeared in guise of a Brahmin, to whom Ravan handed over the lingam till the time he relieved himself. The Brahmin placed the lingam at its present location, Baidyanath dham. Another legend has it that this temple after the palayan of Ravan, the jyotirlinga was forgotten until it was re-discovered by a cowherd Baiju, and hence the name Baijnath. The water of the temple premises is considered to have curative and medicinal properties. Baidyanath is also considered to be one of the 52 Shakti Pitha shrines of Sati. It is believed that the heart of Sati fell here, when her half burnt body, being carried by Lord Shiv at the end of Daksha’s yagya, was cut into pieces by Lord Vishnu’s Sudarshan Chakra. The temple has a pyramidal tower that rises to a height of 72 feet. It is not known how much of the lingam is buried. The lingam is five inches in diameter and projects about four inches from a slab of basalt. The top of the lingam is chipped and has indentations. The temple-top contains three pitcher-shaped gold vessels and a five-bladed trident. The inner top contains an eight- petal lotus jewel, known as Chandrakanta. The Baidyanath temple is built in three distinct sections in the Nagara style. The main section dates back to the age of Ramayana. The Baidyanath temple has a unique tradition, that the worship is not conducted without worship materials from the Muslim family of Halim Sahib and the garland from Deogarh jail. It is said that once the son of the jailor was lost at sea and presumed dead. But the inmates of the jail prayed to Sri Baidyanath and soon there was news of his miraculous recovery. Since then the garland for the evening worship is daily made by the prisoners. For the benefit of mankind Adidev Mahadev Shiv blessed 12 shivlings with His Divine Light. The proof of Lord Shiv’s power is evident from the fact that in spite of being invaded by every possible community and race, all the 12 jyotirlingas still stand intact; each jyotirlinga blessing the created world with a unique energy. We shall make an honest attempt to delve into this aspect of Hindu gods. A word of caution here, the jyotirlingas and any other place of pilgrimage are vortices of energy, places where rishis and munis have performed penance and concentrated the shakti of their tapobal. These are neither picnic spots nor wishing wells, and must only be visited for the purpose of sadhna, as guided by one’s Guru. These are places to open up the blocks in one’s sadhna and untie the bondages of maya. Visiting them with the desire for physical (maya) or entertainment only leads to a mismatch in energy of the visitor and the place, and may have adverse effects. The various calamities that happen at such places are ample proof of this. These places are for vairagya and moksh, not for fun and games.